A story of redemption played out at the Meskwaki Bingo Casino Hotel in Tama, Iowa Sunday night, as Rich Alsup took down the 2015 Mid-States Poker Tour Meskwaki Main Event title and $101,229, after coming runner-up here this past March. 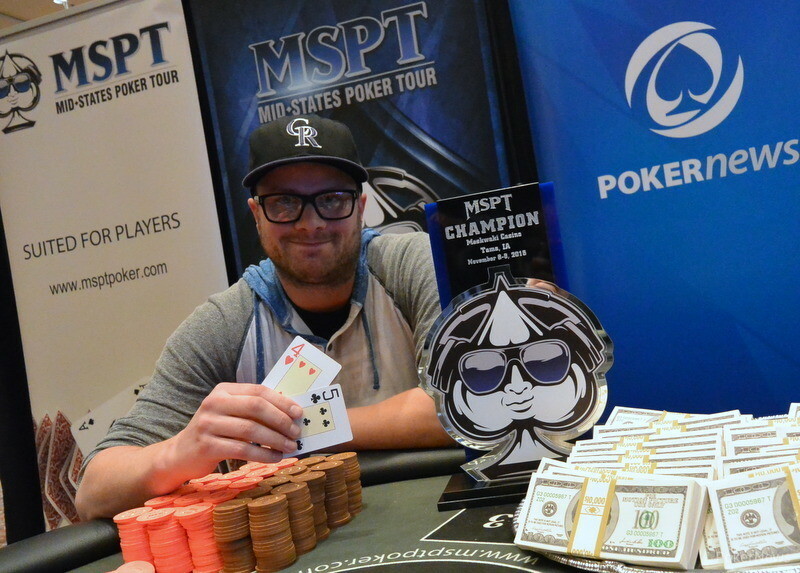 A 31-year-old professional poker player from Eden Prairie, Minnesota, things fell into place time and time again for Alsup at the final table until MSPT glory was finally his. The event drew 410 players over two starting flights, but just 77 survivors returned to vie for the championship Sunday. Play moved quickly past the 45-player money bubble and just after 7 p.m. local time the final table was set with MSPT Pro Matt Alexander firmly in the lead. 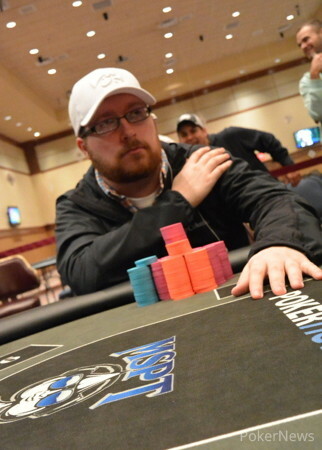 Alsup sat fourth of ten when Jason Seitz busted, running into Hamid Feiz' . Marius Toderici was the next to go when he was outdrawn by Feiz, but Alsup began his move towards the top, busting Day 1 chip leader Marty Faldet eighth, flopping a set of fours against his nines all in preflop. Feiz won a flip to double through Alexander next, then busted him when a clearly frustrated Alexander shoved top pair into his top two. Feiz had moved into the chip lead when Mark Hodge busted sixth, picking up enough MSPT Player of the Year points with his finish to overtake the lead in that race. Feiz' lead would not last, however, as Alsup stung him, shoving over his raise with , getting called by and outdrawing him when they both flopped two pair by making a boat on the river. Feiz fell short, and then exited in fifth place before Shaun Burnett lost a race against Derek Dempster to bow out fourth. Ric Cacho got super short three handed and also gave the last of his stack to Dempster, allowing him to take a lead into heads-up with Alsup. It was a back-and-forth match until the poker gods smiled on Alsup once again, handing him trips on the river after he got it in with bottom pair and a gutshot against Dempster's top pair with the same draw. In the end, Dempster was forced to shove short with the , geot called by Alsup on the similar , and four clubs came out to give Alsup the win. Alsup admitted it just seemed to be his time in Tama as he found himself catching every card needed on the way to winning the 2015 Mid-States Poker Tour Meskwaki Main Event. Next up for the MSPT is a stop at the Golden Gates Casino in Black Hawk, Colorado next weekend, and the PokerNews Live Reporting Team will be there for every flop turn and river. Until then, it's goodnight from Meskwaki. Derek Dempster moved ahead with some strong moves before Rich Alsup completed from the button and Dempster raised it to 500,000. Alsup called and the flop came . Dempster led for 500,000 and Alsup pushed all in. Dempster quickly called and was miles ahead with the over Alsup's . The turn came the , changing nothing, but the river was the , making Alsup trips and handing him the biggest pot of the tournament. Left with just 420,000 in chips, Dempster shipped those two big blinds in the very next hand with the and got the call from Alsup on the . The board ran out and once again, Alsup had the best of it, four-flushing Dempster's hopes down the drain and winning the 2015 MSPT Meskwaki Main Event. In a limped pot, both players checked an flop. Derek Dempster fired 300,000 at the turn, but could not shake Rich Alsup. The river brought the and a check from Dempster. Alsup bet 475,000 and Dempster called, showing the , then mucking when Alsup turned over the for the bigger flush. Rich Alsup has bullied his way into the lead, first betting 800,000 into and 800,000-chip pot on a board with and getting paid off by a hand Dempster did not show. Then check-raising all in on an flop when Dempster bet 250,000 and forcing a fold. Rich Alsup limped the button and Derek Dempster checked his option. The flop came and Dempster check-called a 200,000-chip bet from Alsup. The turn brought the and after Dempster checked again, Alsup bet 450,000. Dempster check-raised all in and Alsup called with the for the straight. Dempster held just the and Alsup was set to double until the river put the straight on board and chopped the pot. After trading pots for a while, things remain as they were, with Derek Dempster holding about a 3:1 advantage over Rich Alsup. Currently the players are taking a 10-minute break. Rich Alsup made it 250,000 and Derek Dempster defended. The flop came and Dempster check-called a 300,000-chip bet from Alsup. Dempster then checked the turn, but when Alsup made it 575,000, he check-raise shipped for 2.8 million. Alsup called with for top-top, but was behind Dempster's two pair. Dempster doubled into a decisive lead after the river missed both. The Final Day of the MSPT Meskwaki Main Event Starts Now!